It's been about a year since I've last made an online safety post so I thought that it's about time that I make another one of these posts. Staying safe online is very important when you're playing Wizard101, interacting on social media, or visiting websites. So let's talk about the various ways you can stay safe online! Wizard101 and Pirate101 are family-friendly games, but you will still come across people who have an alternative motive. There are people who may say they're going to give you gifts (such as crowns or memberships) in return of your password. Others may ask you for your personal information because they say that they're your friends. The best thing to do if you're facing this situation is to use the Ignore option in-game. If it comes to harassment, you can use the report option. Did you know that Kingsisle employees are also impersonated in-game? Someone in-game may say that they or a relative of theirs work at KI when that's not factual. Most of the reasons people say that is to get personal information from you. If someone says that they're a KI employee in-game, ask them for their badge. If they don't show you their badge, report that player. 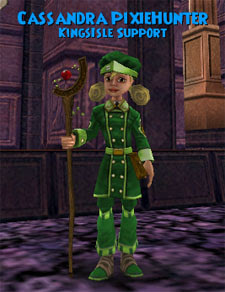 You should see a badge called "Kingsisle Support" under their name if they indeed work for the games. There are many different types of KI-game related sites out there. It's best to keep a close eye out there for scammers. They can also ask for personal information in return for "gifts". If they do, it's best to avoid or even report the site to Kingsisle. If they're asking for your personal information, you should not pay any attention to them. There are fansites out there that you can get stuff from when they have contests, in which the codes are provided by Kingsisle. If you would like to see a list of trustworthy websites, you can click on the hyperlinks below to access the Wizard101 and Pirate101 fansites. 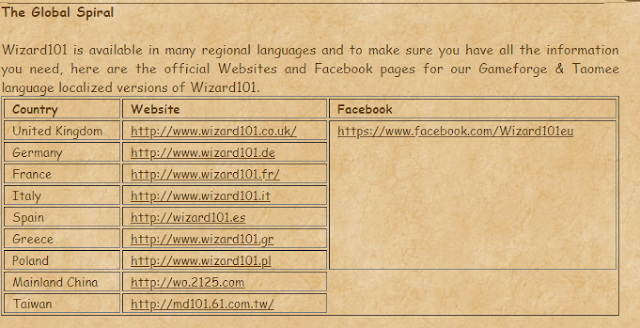 Keep in mind that there are different versions of Wizard101 based on language/area. For example, Wizard101 UK is a different version of Wizard101 based in the United Kingdom from Gameforge. For a full list of these websites, you can view the image below. You can also click on the image to access this list at the bottom of the Fansites list! I have already shared so much with you, but there's actually a lot more than you should know. The main message I'd like you to get out of this post is to NEVER give away any personal information with anyone. Whether it's where you live, your password, or billing information. It's called personal information for a reason. Please keep it personal and continue to stay safe online. Although this is mostly focused around Wizard101 and Pirate101, it really goes beyond the games. This is an internet safety post. Please continue to stay safe online! If you would like more online safety tips beyond this post (including links that provide nice online safety tips), please click on the link below! Thank you so much for reading! Until next time, I'll see you around the spiral. Do you have any online safety tips you'd like to share with the community? Comment them below!